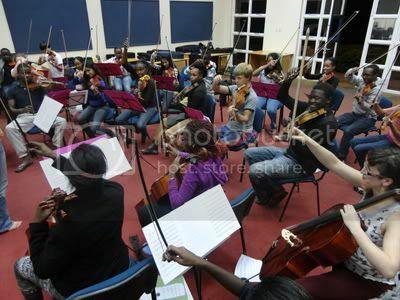 Celebrate Classical Music ... with the Kenya National Youth Orchestra! August 31, 2012, 8:21 AM · Here in Kenya, classical music is still fairly new. The Nairobi Symphony Orchestra has been around since the 1960's, but as far as the general population of Kenya is appreciating music, there is still a long ways to go! Nairobi, the capitol city of Kenya, is bustling with music. Jazz, bands, rap artists ... but not much as far as classical music. 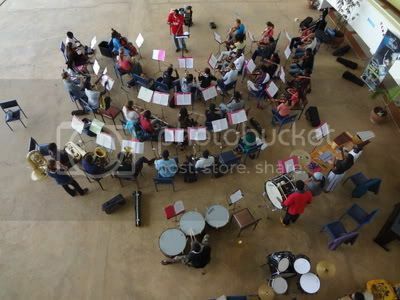 There are a few classical ensembles, the Nairobi Symphony Orchestra, the Kenyan Conservatoire of Music Orchestra, and just recently, the Kenya National Youth Orchestra. I signed on as the director of strings for KNYO back in August 2010. We wanted to audition kids from around Kenya but due to financial reasons we had to audition only in Nairobi. We started out with more of a wind band + seven violins. The strings were in a sorry state! Thankfully, over the next two years, we managed to audition more violinists. We currently have three cellists, three violists and 26 violins. Many of these students do not own their own instrument and we have sometimes had to be creative in borrowing instruments for them. We always need more lower strings, and one day we are hoping to have a double bass! The string section always had to work the hardest against their noisy neighbors, the winds and brass, and they also had to prove themselves as a section as they had started out as the weakest section in the orchestra. At first, I didn't have any help with sectionals, but eventually I was able to get another strings teacher so that we could run string sectionals properly. At our last course, we managed to get a volunteer to come from the UK to help with the cello section. KNYO is a special orchestra, because it features young players who get together three times a year to play and perform classical and Kenyan music. For each concert the students have performed in, we have featured a Kenyan piece alongside their "normal" classical orchestral repertoire. That has been great fun, with the students learning how to improvise together, sing, dance and be spontaneous! Our goal was not just to nurture young players in classical/Western music, but also to develop future leaders and music teachers of Kenya. We saw our leadership program in action at our latest course, where the students had to organize a tour as well as make sure that the stage was set up ready for all the concerts. They did wonderfully with the organizing and everyone worked together. At the moment, we are really struggling financially so it is a project that is probably going to take a while to get off the ground properly. For now, it is a wonderful thing to see these young musicians growing and getting better with each course! I really love being involved with the KNYO and I can't wait for our next course! August 31, 2012 at 09:34 PM · I always have a great respect (as I do for all musician) those musicians who go out and help those who need it those melt and that's is exactly what you have done. You did not quit after seeing how hard the job would be :) you helped them. Good luck with bettering hte orchestra and expanding it. Me, a special one you don't see often, so she took to the atlas and saw Nairobi and fell in love with it thus came my name. very few people can spell my name correctly for those who only hear it, and I'm grateful for those who can spell it without being told. I always try to encourage and make someones day by adding some kind words to what they might hear. I am sincere about my wishes for the orchestra to become better (as it seems to be doing). Im passionate little musician and wish the best for anyone involved with it.